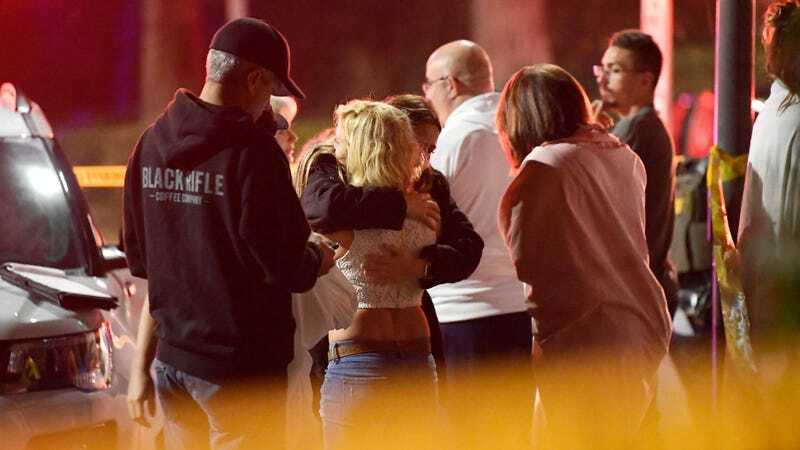 Twelve people were killed by a hooded gunman at the Borderline Bar & Grill, a country dance bar in Thousand Oaks, California on Wednesday night. That number includes the first officer in the door, Sheriff’s Sgt. Ron Helus. Politico reports that hundreds fled the scene, using bar stools to break windows and escape. Many sustained injuries. The gunman is also dead, though authorities have yet to reveal how he died, his name or motive. This is the deadliest mass shooting in the United States since 17 children and teachers were killed at Marjory Stoneman Douglas High School in Parkland, Florida on Valentine’s Day this year. Update, 10:27 a.m.: According to AP, the Thousand Oaks shooter has been identified as Ian David Long, a 28-year-old man armed with a single handgun. He was found dead on the scene. Ventura County Sheriff Geoff Dean believes Long died of a self-inflicted gun shot wound.